New Year’s Eve definition: ringing in new beginnings and leaving behind happy endings, and while you’re at it, dousing yourself in an unnecessary–but also an absolutely necessary–amount of glitter. The absolute best part of New Year’s Eve is that special once-a-year treat to get extra glittered up. I’ve always been quite the sucker for sequins, meaning my absolute favorite part about hitting the town for NYE is the sparkly ensembles. Seriously, if you know me personally, you know I’m not you’re average going out gal-pal (definitely not my forte). Thus, with 2015 comes resolutions, fresh starts, champagne toasts, and a dazzling #ootn (outfit of the night). And ladies, the big night is just right around the corner (don’t you always feel like it sneaks up on you so fast?). 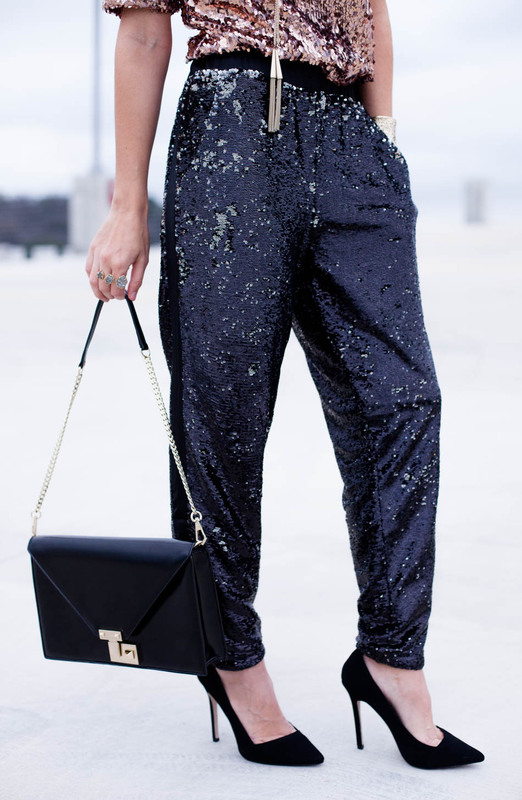 In the midst of this year’s NYE planning, I discovered this pair of sequin joggers by Topshop, and I discovered them on sale (s-t-e-a-l!). These Topshop sequin pants are so cozy and warm on the inside, I feel like they’re a lounging pair of PJs you could most definitely sleep in. I’m thinking they could even transition from season-to-season, especially if you paired them with a neutral dressed-down crop. I paired this glittery ensemble with a sequin blush cropped top (affordable, too!) and my favorite Kendra Scott jewels and Kate Spade studs. Scroll below to see the rest of my soon-to-be New Year’s Eve deets, and happy resolution-sourcing, darlings! 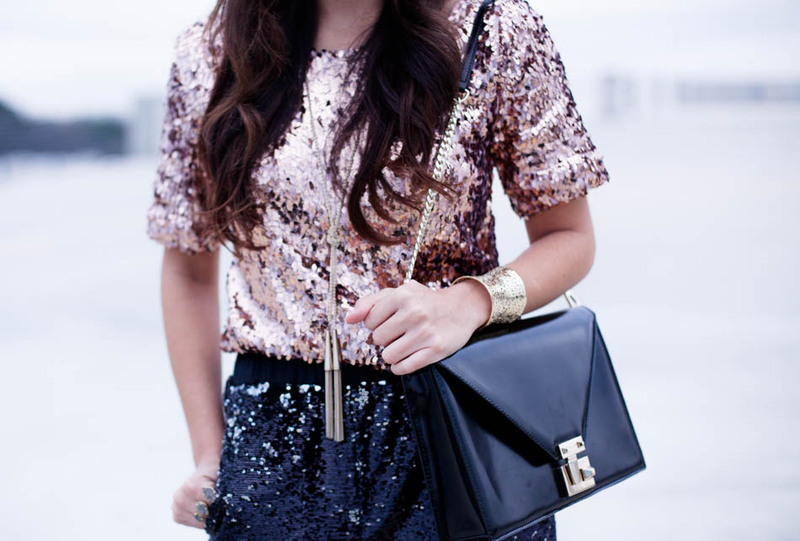 Love the sequins on sequins! I totally agree, NYE always comes out of nowhere!